Oxides of sulfur (also called SOx) are highly reactive gasses that mainly result from the burning of compounds containing sulfur. All fuels commonly used by people (oil, coal, natural gas, wood, etc.) contain some sulfur, and during combustion sulfur reacts with oxygen to form SOx. Sulfur dioxide (SO2), one of the EPA criteria pollutants, is used as an indicator of all sulfur oxides in ambient air as it is the component of greatest concern and the most easily measured (UDAQ, 2014g). Other gaseous sulfur oxides are typically found in the atmosphere at concentrations considerably lower than sulfur dioxide (EPA, 2014g). Sulfur dioxide is colorless, has a pungent odor, and dissolves very easily in water (ATSDR, 1998). When released into the atmosphere, sulfur dioxide can react with other components in the air to form some of the small particles that make up particulate matter, primarily sulfate compounds. The atmospheric lifetime of sulfur dioxide is about 10 days (ATSDR, 1998). Sulfur dioxide can also be converted to gaseous sulfur trioxide and liquid sulfuric acid, which are major contributors to the formation of acid rain (ATSDR, 1998; UDAQ, 2014g). Aerosolized sulfuric acid droplets can also be a component of particulate matter. If dissolved in water, sulfur dioxide can form sulfurous acid. Sulfur dioxide can also be absorbed into the ground, but it is not known if or how it moves in soil (ATSDR, 1998). When air containing sulfur dioxide is breathed, it is absorbed into the body through the nose and lungs where it easily and rapidly enters the bloodstream. Once in the body, it is broken down into sulfate and is excreted in urine (ATSDR, 1998). Short term exposure to very high concentrations of sulfur dioxide can be life threatening. Exposure to 100,000 parts per billion (ppb) of sulfur dioxide is considered immediately dangerous to life and health (ATSDR, 1998). Previously healthy miners who breathed sulfur dioxide released due to an underground explosion in a copper mine experienced burning of the nose and throat, breathing difficulties, and severe airway obstruction (ATSDR, 1999). Long term exposure to lower levels can also result in harmful health effects. Workers exposed to 400 – 3,000 ppb of sulfur dioxide for 20 years or more experienced lung function changes. However, they were also exposed to other chemicals during the same period, so their health effects may not be due to sulfur dioxide alone (ATSDR, 1998). People with asthma are sensitive to the respiratory effects of low concentrations of sulfur dioxide (250 ppb), particularly while exercising (ATSDR, 1999). Studies have also shown a connection between short term sulfur dioxide exposure and increased visits to the emergency room and hospital admissions for respiratory illnesses, particularly among sensitive populations like asthmatics, the elderly, and children (EPA, 2014g). As atmospheric sulfur dioxide contributes to the formation of particulate matter, the health effects associated with PM are also of concern. Children experience many of the same health effects from sulfur dioxide exposure as adults, but it is not known whether they are more vulnerable to exposure. Children may be exposed to more sulfur dioxide than adults because they breathe more air for their body weight than adults do (ATSDR, 1999). Long term studies examining large numbers of children have suggested possible associations between sulfur dioxide pollution and respiratory symptoms or reduced breathing ability. Children who have breathed sulfur dioxide may develop more breathing problems as they get older, make more emergency room visits for wheezing fits, and may get more respiratory illnesses than other children (ATSDR, 1998). Children with asthma may be particularly sensitive sulfur dioxide exposure, but it is not known whether asthmatic children are more sensitive than asthmatic adults (ATSDR, 1999). Some recent studies have identified possible associations between maternal exposure to sulfur dioxide and adverse birth outcomes, such as preterm birth (EPA, 2013m; Shah et al., 2011). Oxides of sulfur, including sulfur dioxide, come from a variety of sources, both manmade and natural. Volcanic eruptions are sporadic but significant natural source of SO2 (ATSDR, 1998). The burning of fossil fuels is the primary human related source of sulfur dioxide emissions in the U.S. In 2014, 82% of the approximately 4.8 million tons of sulfur dioxide released in the U.S. was due to fuel combustion, primarily electricity generation from power plants. Industrial processes, such as copper smelting, were responsible for an additional 12% of sulfur dioxide emissions (Figure 1) (EPA, 2016f). Those figures hold true of the over 28,000 tons of sulfur dioxide released in Utah during 2014 (Figure 2). 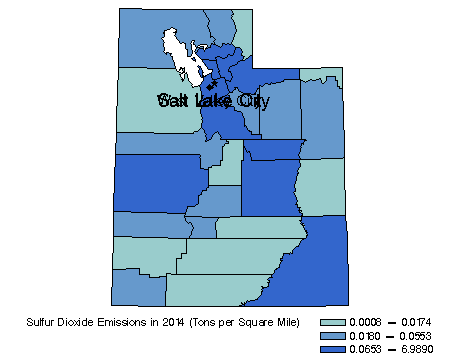 Over 75% of the sulfur dioxide released in Utah in 2014 was from coal-fired power plants. A county level distribution of sulfur dioxide emissions in Utah is presented in Figure 3 (EPA, 2016g). The primary National Ambient Air Quality Standard (NAAQS) for sulfur dioxide is 75 parts per billion (ppb), averaged over one hour (EPA, 2013k). This standard, announced by EPA in 2010, was designed to protect sensitive individuals from short term exposure to high concentrations of sulfur dioxide. Simultaneously, EPA revoked the two previous primary standards of 140 ppb averaged over 24-hours and 30 ppb averaged over a year, as they were not felt to add any protection beyond what the new one hour standard provides (UDAQ, 2014g). 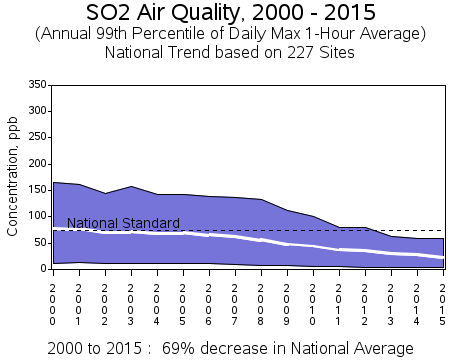 As with the nitrogen dioxide, ozone, and particulate matter standards, the sulfur dioxide primary NAAQS is averaged over rolling three year periods. 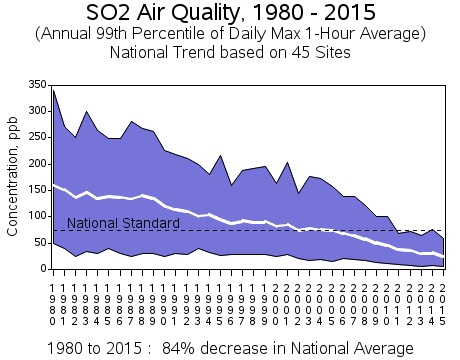 Nationally, average sulfur dioxide levels have declined dramatically over the past 30 years, decreasing by 84% between 1980 and 2015 (Figure 4) and 69% between 2000 and 2015 (Figure 5). The national average sulfur dioxide concentration has been continuously below the most recent primary standard of 75 ppb since 2002. 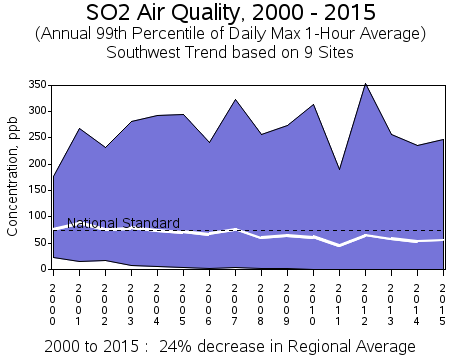 The Southwest region states of Arizona, Colorado, New Mexico, and Utah have also experienced a decline in sulfur dioxide levels since 2000, although at 24% the extent has been smaller (Figure 6). 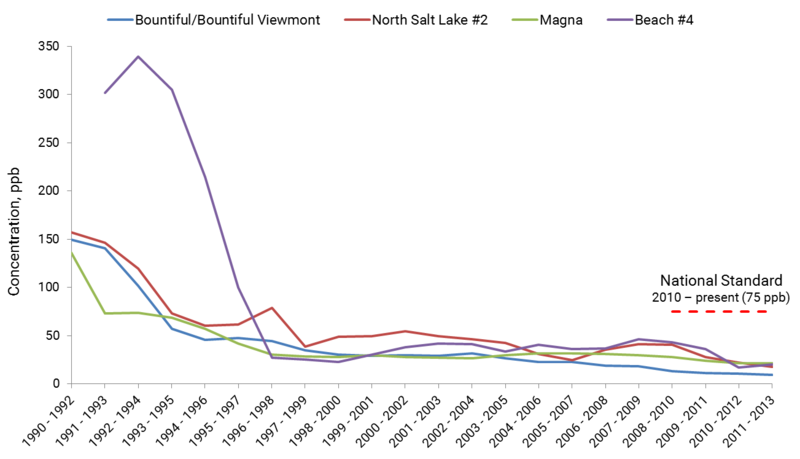 In the Wasatch Front area of Utah, sulfur dioxide levels have decreased substantially since 1990, with the majority of the decline occurring in the early to mid-1990s (Figure 7). This decrease was largely due to replacement of Kennecott Copper Corporation’s reverberatory smelter with a newer and cleaner Noranda smelter using the Flash Smelting Process in June 1995 (UDAQ, 2014g). Since that time, sulfur dioxide concentrations have remained fairly steady and well below the NAAQS. 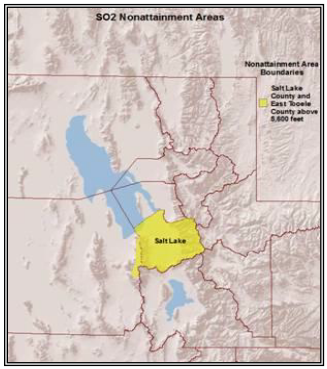 EPA designated Salt Lake and Tooele Counties as sulfur dioxide nonattainment areas in 1978 based violations of the 1971 primary and secondary NAAQS. In 1981, EPA removed nonattainment status for all of Tooele County except the eastern portion closest to Salt Lake County above 5,600 feet (Figure 8). EPA approved Utah’s State Implementation Plan to address sulfur dioxide violations in 1994, and no violations have been recorded since sulfur dioxide controls were implemented at industrial facilities like the Kennecott smelter (UDAQ, 2014g). In October 2011, Utah requested that EPA designate Salt Lake and Davis Counties as attainment areas, based on years of air monitoring data showing sulfur dioxide levels below the NAAQS, and designate the remaining 27 counties in Utah as unclassifiable, based on insufficient monitoring data (UDAQ, 2011). As of 2015, no area in Utah is listed as nonattainment for the 2010 sulfur dioxide primary NAAQS on EPA’s website (EPA, 2014j).